This entry was posted in Events on February 23, 2019 by Jo Ellen Benson. 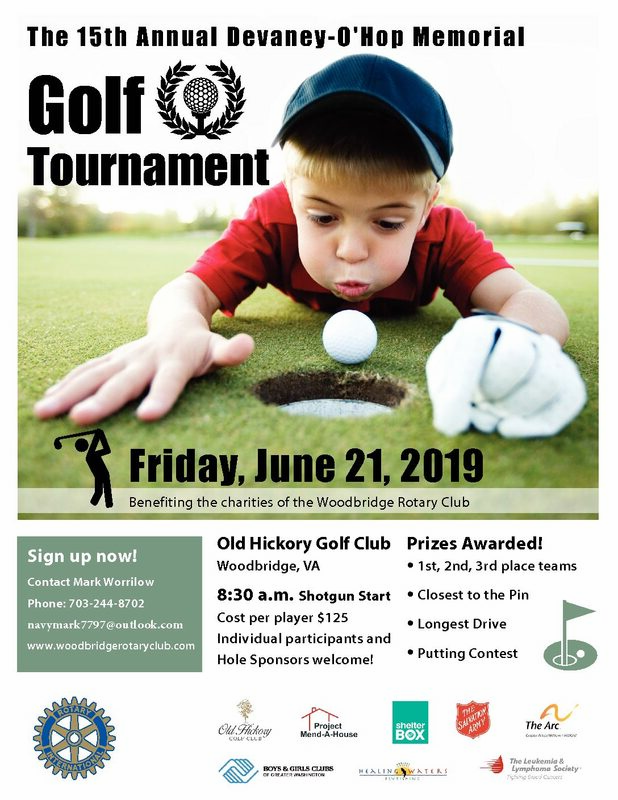 The Devaney-O’Hop Memorial Golf Tournament supports the charities of Woodbridge Rotary including ACTS, ARC of Prince William, Polio Eradication World Wide, American Cancer Society, Boys and Girls Club, and numerous others. This will be a captain’s choice 4 –person scramble tournament with a 8:30 am shotgun start held at Old Hickory Golf Club in Woodbridge Virginia. The post-event awards luncheon will highlight prizes awarded for the first, second and third place teams (and last place). This entry was posted in Events on May 19, 2018 by Jo Ellen Benson. JOIN US FOR OUR 11th ANNUAL JOE DEVANEY MEMORIAL GOLF TOURNAMENT. This entry was posted in Events on May 15, 2015 by Jo Ellen Benson.